Strictly speaking in situ (In 'si:tu) or (In 'si:chu -- like a sneeze) is Latin for in 'place'. However for a range of scientific and industrial markets, it refers to the evaluation of a material in its most natural use environment. Expertise is key to evaluating bioproduct performance simulating the in situ environment as best as possible. More importantly, for a given product it is the combination of our knowledge of the appropriate microbiological test methods and their limitations that results in the best assessment and finished product cost and performance. Is Situ Biosciences a specialty chemical company? 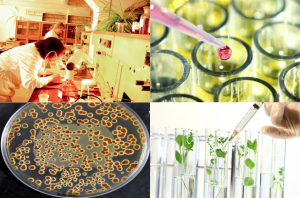 Situ Biosciences LLC is an independent microbiology consultation and testing laboratory. We provide an unbiased assessment for the best antimicrobial solutions globally available, to solve your problem or enhance your finished product performance. What is a biocide? Is it different than an Antimicrobial? Antimicrobial, biocides, antibiotics, insecticides, etc. ...are all generic names used to identify regulated chemical agents used in controlling different types of microorganisms in a broad spectrum of applications. Regardless of their common name, in the United States they are predominantly regulated by the Environmental Protection Agency under the general category of Pesticides. Medical devices such as high-level disinfectants are regulated by the FDA, along with food and food contact additives. As their regulation is both chemical identity and end use specific, there are few unilateral descriptions that apply to these types of additives. Antimicrobials and biocides are most associated with the control of microorganisms such as bacteria, fungi, and algae. They are typically described as Biocides in industrial applications such as bulk preservation or manufacturing uses, and as Antimicrobials for consumer products. Regardless, the active ingredients could be interchangeable. For more information on the definition and regulation of biocides see the relevant regulatory authorities: US Environmental Protection Agency (U.S. EPA); US Food and Drug Administration (U.S FDA); and European Biocidal Products Directive. What are industrial test methods and why are they important? What are Industrial Standard Test Methods? Industrial standardization has allowed industries to apply best practices to how their products are made. This allows for manufacturing to known degrees of accuracy and interchangeability. Standards now include a range of test criteria for most products made and used in industry and by consumers. What are Microbial Test Standards? For antimicrobials, the standardized tests are a series of microbiological assays that integrate, as much as possible, the use conditions for a given product. These methods need to be accurately reproducible to benefit both the manufacturer and customer. Why is Standardized Testing Used? Industrial standards represent the best way to provide performance comparisons across an industry, independent of the site where the test is performed. Because of a long history of proven reliability, regulatory agencies such as the EPA accept these methods as evidence for valid product testing. Is there a standardized test that is best for a given product? First assess the formulation, performance and regulatory needs and then devise a validation/certification plan for assessment testing. Aerobic in which organisms use oxygen as part of the respiration for consumption of nutrients, and Anaerobic in which organisms use other elements such as sulfur, in the process of respiration and consumption of nutrients. In the real world, there is typically a continuum of these two processes, but in waste treatment facilities, the facility is managed in such a way that one or the other process is the predominant form of degradation. For most commercial markets, aerobic biodegradation is preferred. For more about aerobic biodegradation, call the lab at 847-483-9950. Antimicrobials are a class of ingredients used in a tremendous range of raw materials and finished goods. The objective of these ingredients is to protect or to enhance the useable lifespan in the presence of microorganisms present in nearly all environments. Antimicrobials target the microorganisms in the product and bioproduct additives target the residual effects of the microorganisms such as stains or odors. Originally developed for use as biocides, antimicrobial additives are used in nearly every industry and consumer product market. As with any auxiliary, antimicrobials may affect the other additives used in and or on the product (dyes, UV protection, durability enhancers, etc.). When selecting the antimicrobial, consideration should be made of the product's primary performance characteristics. For more information on how an antimicrobial additive may affect the overall performance of a product, contact the lab at 847-483-9950.